The Cincinnati Bearcats got their first Big East win of the season Wednesday night and now they roll into the RAC to face a tough Rutgers team. Cincinnati is coming off a close, emotional win and they play again Monday night. The Cats have played 2 true road games this season. Those were at Xavier and at UAB. We know how those games went. It's going to be interesting to see if the Cats bring the same intensity they had Wednesday, and that you would think they will have Monday, on the road on a non-nationally televised game Saturday night. Let's take a look at how these teams stack up, and predictions, after the jump. All stats taken from KenPom.com, the Polls, and the school's websites. The first thing that pops off the page is that Hamady Ndiaye is averaging 5.4 blocks a game. He's put up 6,6,4,3,3,4,4,8,6,9,10,2. In their losses, he's had 3, 4 and 2, so that's rather encouraging I guess. He's a shot blocking monster. Oh and he averages 21 minutes a game. The Cats didn't get blocked by UConn, so it will be interesting to see what they do against the second best team in terms of block percentage. Rutgers has lost to Vermont, as well as Florida and North Carolina. They have played a very, very, very soft schedule outside of Florida and UNC though. Mike Rosario can put in buckets, and is a great player. I think Larry Davis will start again and be put on Rosario. Maybe Lance will get a crack at him. The key for UC is to keep the momentum going. To get their first win on the road, the Cats need Deonta Vaughn to play like he did against UConn. 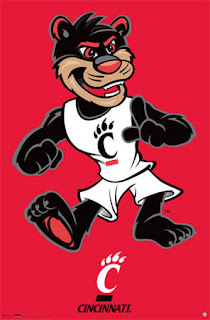 If Lance and Deonta are scoring, UC is hard to beat. I would like to see a little more from Yancy Gates. He didn't set the world on fire against UConn. My sleeper player of the day is Ibrahima Thomas. He looked good against UConn. Ibby needs to get stronger around the basket on offense, and I think that he will start tonight. http://ticketfront.com/event/Rutgers_Scarlet_Knights-tickets looking forward to it. UC 3 Point Shooting; How Bad Is It?